On the 10th (Fri), identify plant and animal life at Berowra Valley National Park and then ponder the design of Hornsby Water Clock. You can plan Wahroonga trip in no time by asking Inspirock to help create your itinerary. Sydney to Wahroonga is an approximately 1-hour car ride. Traveling from Sydney in May, plan for slightly colder nights in Wahroonga, with lows around 10°C. Wrap up your sightseeing on the 10th (Fri) to allow time to travel to Kangaroo Valley. Kangaroo Valley is a river valley along the Kangaroo River in the Shoalhaven region of New South Wales, Australia, located west of the seaside in the City of Shoalhaven. On the 11th (Sat), explore the striking landscape of Bendeela Camping and Picnic Area. For photos, ratings, where to stay, and more tourist information, use the Kangaroo Valley tour itinerary app . Getting from Wahroonga to Kangaroo Valley by car takes about 2.5 hours. May in Kangaroo Valley sees daily highs of 23°C and lows of 11°C at night. Finish your sightseeing early on the 11th (Sat) so you can travel to Canberra. 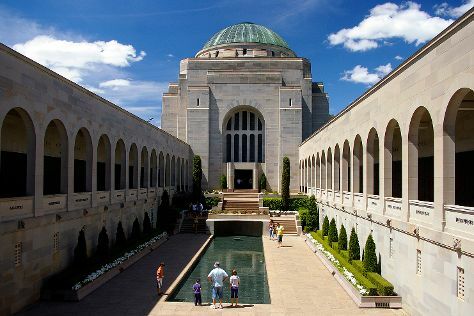 On the 12th (Sun), take in the architecture and atmosphere at St John the Baptist Church, explore the world behind art at National Gallery of Australia, then don't miss a visit to Mugga-Mugga Cottage, then take an in-depth tour of Australian War Memorial, and finally admire the landmark architecture of Canberra Rotary Peace Bell. Get ready for a full day of sightseeing on the 13th (Mon): engage your brain at Questacon, then explore the world behind art at National Portrait Gallery, and then ponder the world of politics at Parliament of Australia. To see photos, traveler tips, ratings, and other tourist information, refer to the Canberra online itinerary planner . Drive from Kangaroo Valley to Canberra in 2.5 hours. Plan for slightly colder temperatures traveling from Kangaroo Valley in May, with highs in Canberra at 19°C and lows at 2°C. Cap off your sightseeing on the 13th (Mon) early enough to travel to Wagga Wagga. Kick off your visit on the 14th (Tue): browse the eclectic array of goods at River & Wren Market, then take in the exciting artwork at Wagga Wagga Art Gallery, then examine the collection at Coolamon Fire Museum, and finally contemplate the long history of Monte Cristo Homestead. To see ratings, maps, more things to do, and other tourist information, refer to the Wagga Wagga holiday planner. You can drive from Canberra to Wagga Wagga in 3 hours. Traveling from Canberra in May, you can expect nighttime temperatures to be a bit warmer in Wagga Wagga, with lows of 6°C. Cap off your sightseeing on the 14th (Tue) early enough to travel to Deniliquin. Deniliquin, known locally as "Deni", is a town in the Riverina region of New South Wales close to the border with Victoria. Port of Echuca Discovery Centre and Jerilderie Historic Residence will appeal to history buffs. Do some cultural sightseeing at The Great Aussie Beer Shed and Barmah Forest Heritage and Education Centre. Explore Deniliquin's surroundings by going to Echuca (Echuca Historical Society Museum & National Holden Motor Museum : Echuca) and Monichino Wines (in Katunga). The adventure continues: learn more about the world around you at Peppin Heritage Centre. To see other places to visit, more things to do, reviews, and more tourist information, read our Deniliquin trip itinerary builder tool . Getting from Wagga Wagga to Deniliquin by car takes about 3 hours. Finish up your sightseeing early on the 17th (Fri) so you can travel to Mildura. On the 18th (Sat), explore the world behind art at Mildura Arts Centre & Rio Vista Homestead, then appreciate the extensive heritage of The Chaffey Trail, then steep yourself in history at Psyche Bend Pumping Station, and finally learn about all things military at RAAF Memorial & Museum. For more things to do, photos, traveler tips, and other tourist information, read Mildura trip app . You can drive from Deniliquin to Mildura in 4 hours. May in Mildura sees daily highs of 23°C and lows of 9°C at night. Cap off your sightseeing on the 18th (Sat) early enough to travel to Broken Hill. Kick off your visit on the 19th (Sun): explore the different monuments and memorials at Silverton Cemetery, explore the world behind art at Pro Hart Gallery, see the interesting displays at Sulphide Street Railway & Historical Museum, then contemplate the long history of Broken Hill Trades Hall, and finally take in the spiritual surroundings of Synagogue of the Outback. For ratings, more things to do, and more tourist information, refer to the Broken Hill journey builder . You can fly from Mildura to Broken Hill in 1.5 hours. Alternatively, you can drive; or take a bus. Traveling from Mildura in May, expect a bit warmer with lows of 16°C in Broken Hill. Finish your sightseeing early on the 19th (Sun) so you can travel to Cobar. Cobar is a town in central western New South Wales, Australia. Kick off your visit on the 20th (Mon): stroll through Cobar Miners Heritage Park, take an in-depth tour of Great Cobar Heritage Centre, then get outside with Cobar Memorial Swimming Pool, and finally contemplate the long history of Mount Grenfell Historic Site. To see ratings, traveler tips, where to stay, and other tourist information, go to the Cobar tour itinerary maker tool . You can drive from Broken Hill to Cobar in 5 hours. Expect a bit cooler evenings in Cobar when traveling from Broken Hill in May, with lows around 9°C. Cap off your sightseeing on the 20th (Mon) early enough to travel to Dubbo. On the 21st (Tue), stroll through Taronga Western Plains Zoo, contemplate the long history of Old Dubbo Gaol, and then get lost in a book at Macquarie Regional Library. Planning Dubbo trip won't be overwheling when you use's Insprock itinerary maker. Getting from Cobar to Dubbo by car takes about 3.5 hours. May in Dubbo sees daily highs of 23°C and lows of 7°C at night. Wrap up your sightseeing on the 21st (Tue) early enough to travel back home.